Timber newel caps for finishing staircase newel posts. 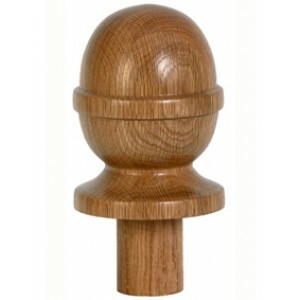 The acorn is a simple but stylish design of newel cap that has a traditional feel to it. This shape would work particularly well with rounded newel posts of various designs, and this Fernhill range has a large selection of design choices, to suit an array of stunning styles. The Fernhill range is ideally suited to producing an impressive staircase that will last for many years and will be an incredible addition to any hallway. These parts are produced in a choice of attractive timbers, so you will always be able to find something to suit you.